I am so delighted with my drawing. Don’t I look fabulous darling? 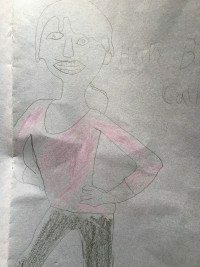 It’s me as the yoga and dance tutor at TreeHouse, Primary School for children living with autism. Drawn by one of my very talented pupils aged 10 years old.